The residents of Belle Harbor Manor spent four miserable months in emergency shelters after Superstorm Sandy’s floodwaters surged through their assisted-living center on New York City’s Rockaway peninsula. Now, the home’s disabled, elderly and mostly poor residents have a new headache: The Federal Emergency Management Agency has asked at least a dozen of them to pay back thousands of dollars in disaster aid. 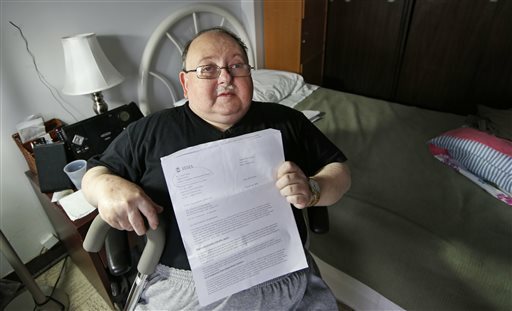 Robert Rosenberg, 61, was among the Belle Harbor Manor residents who recently got notices from FEMA informing them that they had retroactively been declared ineligible for aid checks they received two years ago in the storm’s immediate aftermath. The problem, the letters said, was that the money was supposed to have been spent on temporary housing, but that never happened because the residents were moved from one state-funded shelter to another. FEMA gave Rosenberg until Nov. 15 to send a refund check for $2,486 or file an appeal. “We’re on a fixed income. I don’t have that kind of money!” said Rosenberg, who suffers from a spinal disability and other chronic health problems. He said he spent the aid money long ago on food and clothing, both of which were in short supply after the storm. The demand letters are part of a broader FEMA effort to recover millions of dollars in aid payments that went to ineligible households, either because of errors, a misunderstanding of the rules or outright fraud. The Associated Press reported in September that FEMA was scrutinizing 4,500 households it suspected had received improper payments. At that time, 850 had been asked to return a collective $5.8 million. The other cases were still under review. The AP on Tuesday asked for updated numbers on the number of storm victims who had been asked to return money, but FEMA didn’t immediately provide them. Data obtained through a previous public records request, however, showed that as of July 30, the agency was considering a recoupment action against 35 residents of assisted living facilities in the same part of Queens that is home to Belle Harbor Manor. Collectively, those residents had received $108,598, with most of that money intended to cover temporary housing. Five residents had also received aid to cover destroyed belongings. After their chaotic evacuation, Belle Harbor Manor residents were initially taken to a huge evacuation center set up inside a Brooklyn armory, then spent a brief period sleeping four-to-a-room at a hotel in a crime-plagued neighborhood where they were advised not to go outside after dark. The state then moved the residents, many of whom suffer from mild mental illnesses, to a halfway house on the grounds of a partly-abandoned psychiatric hospital in Queens, where they bunked on cots and were barred from having visitors in their rooms. Rosenberg said the FEMA workers who urged him to apply for assistance during the period when residents were staying at the armory never explained that the money could only be used for housing. At the time, it wasn’t clear how long they would be in the shelter, or where they would go next. FEMA spokeswoman Rafael Lemaitre said the agency was required by law to recoup improper payments but did not directly address the residents’ situation. “FEMA remains committed to working with applicants and ensuring they have an understanding of the options available to resolve their debt, which includes making a payment, filling an appeal, requesting a compromise and establishing a payment plan,” he said. More common types of FEMA recoupment actions involve households ineligible for assistance because their damaged properties were vacation homes or rental properties, or families that received extra payments because more than one household member had applied for assistance. FEMA also commonly recoups emergency aid payments for damage later covered by insurance. Lawyers at MFY Legal Services, a legal aid group that has worked with adult home residents in the past, have offered to help Belle Harbor Manor residents with their appeals. “Our position is that it would be an unbearable financial hardship and unjust,” to require the residents to repay the money, said MFY attorney Nahid Sorooshyari. Yeah, it would be terrible for those who received unexpected and undeserved money from our tax dollars in error to have to repay it. Isn’t there a way to protect the recipients under an anti-ex post facto law?